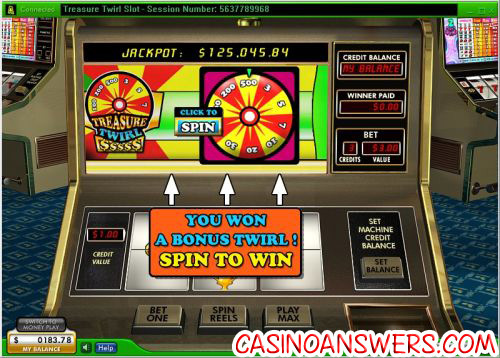 Treasure Twirl Classic Slot Guide & Review - Casino Answers! Treasure Twirl is a 3-reel, 1-line classic slot machine, featuring a wild symbol, a bonus game and a progressive jackpot. You can play the Treasure Twirl slot machine at 888 Casino and Lucky Ace Casino. As with many progressive jackpot slots, Treasure Twirl has a fixed coin size of $1. You can play 1-3 coins, which equates to $1, $2 or $3 per spin. Casino Answers recommends playing the maximum bet at all times on Treasure Twirl. To play the maximum bet, hit the “Play Max” button or use your spacebar. For other bets, use “Bet One” to bet a coin the appropriate number of times followed by the “Spin Reels” button. To win the Treasure Twirl progressive jackpot you must hit three Wheel symbols on the center payline. Only maximum bet spins can qualify for the progressive jackpot. While writing this slot review, the Treasure Twirl progressive jackpot was at over $125,000 and ready for you to take it home! Try and win the Treasure Twirl Progressive Jackpot now at 888 Casino! There are 8 winning combinations on the Treasure Twirl progressive jackpot slot machine. The full payout schedule is as follows (1/2/3 coin payouts in parenthesis): 1 Cherry symbol (2/4/6), 2 Cherry symbols (10/20/30), any combination of 3 Crown/Trophy/Diamond symbols (10/20/30), 3 Cherry symbols (20/40/60), 3 Diamond symbols (20/40/60), 3 Trophy symbols (50/100/150), 3 Crown symbols (100/200/300), 3 Wheel symbols (15,000/30,000/jackpot). Treasure Twirl doesn’t lie by advertising a treasure. 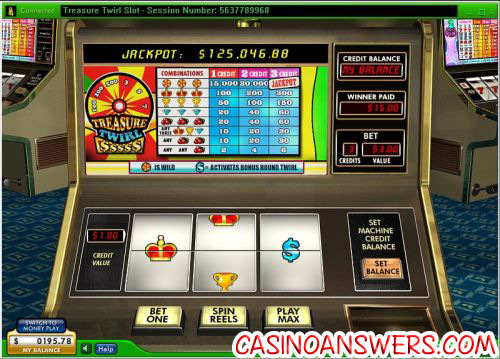 The progressive jackpot on the Treasure Twirl slot machine is one of the biggest in online slot machines. To play for the Treasure Twirl progressive jackpot at only $3 a spin, sign up today at 888 Casino! How do I win the Treasure Twirl progressive jackpot? You can win the progressive jackpot on the Treasure Twirl slot game by betting $3 on a spin and hitting three Wheel symbols on the active payline. Can USA players play the Treasure Twirl slot machine for real money? Unfortunately, USA players cannot play for the Treasure Twirl progressive jackpot. For a USA-friendly progressive jackpot slot, please read our Red, White and Win Progressive Jackpot Slot Review or play for it now at Online Vegas Casino. What’s the treasure progressive jackpot slot called?